The Knicks have intensified their pursuit of 39 year-old Derek Fisher and are looking to hire him as their head coach this week. 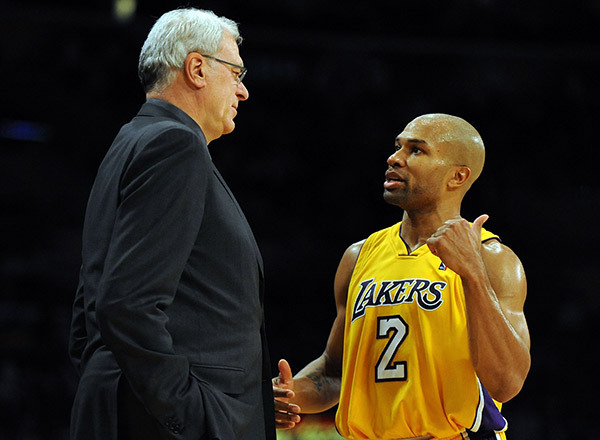 Fisher won 5 championships under Knicks President Phil Jackson during his playing career, the end of which he is expected to announce shortly. ESPN’s Marc Stein was the first to report the news on Fisher. Fisher is the all-time record holder in playoff games played and is considered a strong leader both on and off the court. Fisher served as the president of the NBA Players Association from 2006 to 2013. Jackson has reportedly only shown interest in inexperienced coaches with whom he has a prior relationship, including Steve Kerr, who Jackson thought he had landed before the Golden State job opened up and Kerr took a deal with the Warriors. Fisher fits what Jackson is looking for: Smart, responsible, young (for a coach), a Jackson pupil, and somebody well-acquainted with Jackson’s “Triangle Offense”. Jackson reportedly plans on being very involved in the coaching of this year’s team even though he will not be taking the job for himself, so whichever coach Phil hires will certainly be running things the way the 13-time NBA champion wants them to be run. I think Fisher would be a solid hire, and since he will be guided by arguably the greatest coach in the game’s history if he takes the job, the Knicks should have some newfound structure on the court this coming season. Everybody thought the Kerr deal was wrapped up, so there’s obviously no guarantee that Jackson will be able to reel Fisher in. But with New York’s main competition, the LA Lakers, reportedly dropping their pursuit of Fisher, expect the longtime point guard to be announced as the Knicks’ coach before too long. This entry was posted in Articles and tagged derek fisher, derek fisher coach, derek fisher knicks, derek fisher knicks coach, derek fisher phil jackson, derek fisher triangle, KNICKS, knicks coach, KNICKS MEMES, Knicks news, knicks rumors, knicks triangle, phil jackson, phil jackson knicks, phil jackson triangle, Tommy Rothman, tommy rothman knicks on June 9, 2014 by Tommy Rothman.